When it comes to parenting, there are a gazillion decisions to make for your little one. One of the most important decisions you'll make is figuring out where, what, and how your newborn will be sleeping. We've put together an updated and comprehensive guide to everything you need to know about baby cribs and bassinets. We know you're busy researching a long laundry list of questions about your baby, so we hope this guide will save you time as you prepare for your newborn! If you're short on time, you can skim through our summary chart at the bottom of the article. For starters, what's the difference between baby cribs and bassinets? A crib is much larger and heavier than a bassinet and allows for a lot of space around your newborn while they sleep. It has tall sides that prevent your baby from falling out. Most cribs aren't meant to be moved around and are usually stationary. Cribs are more expensive than bassinets, and are considered an investment since you can use it for several years. Bassinets are much smaller and cozier than cribs. Because of the size, they have a smaller footprint and can be placed in tighter fitting areas. They have shorter sides and are much lighter than cribs. It is portable and may come with a hood to shield your baby from sunlight. Bassinets are also much cheaper than cribs, but have a shorter usage period. How Long Can I Use a Baby Crib vs a Bassinet? Baby cribs are meant to be used until your baby is 1 to 3 years old. (When to move your child to a bed is a whole 'nother post!) Bassinets have a much shorter usage period, ranging from 3 to 6 months. 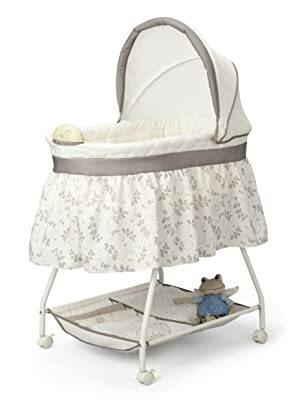 When your baby can sit up on his/her own or roll over, you want to transition your baby out of a bassinet to prevent him/her from falling out of the bassinet. Bassinets will also come with a weight limit, so be sure to move your baby out before he or she hits that weight. A crib can be used much longer due to the taller sides, and allows more space for a larger baby. Your baby can sleep in the crib for a few years. How Expensive is a Baby Crib vs a Bassinet? Baby cribs typically range between $100 to $300, with higher end baby cribs reaching more than $500+ in price. Bassinets are more affordable as they range between $30 to $100, with higher end ones falling in the $200 to $300 range. As you can see, bassinets are about a third of the cost of baby cribs. 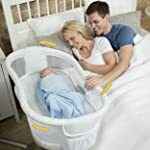 If you want to delay making a larger purchase right off the bat or have the luxury to invest in both, you may want to purchase a bassinet for those first few months and invest in a crib later on. Since you will eventually need a crib for when your baby transitions out of the bassinet, it may be more economical to purchase only a crib as well. How Easy is It to Use a Baby Crib vs a Bassinet? 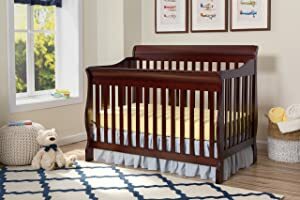 Using a baby crib may be more difficult for mothers in the first few weeks or months after childbirth since the tall sides of a baby crib require you to bend over to place your baby down. If you are shorter, plan on having a C-section, or have any other back pain or complications from childbirth, using a bassinet will be much easier physically. The sides are much shorter, and bassinets usually are tall enough so that you won't have to bend over as much to lay your baby down. A bassinet may also be more comfortable for nighttime feeding, since a smaller footprint means that you can leave the bassinet in your room and you can place your baby within arm's reach. Also, if you are breastfeeding it will be much easier to move your baby from their sleeping position to a feeding position. Co-sleeping vs crib sleeping is a topic with a lot of nuances that we won't dive into here, but if you choose co-sleeping (sleeping with your baby in the same room), a bassinet will be ideal in those first few months since a bassinet is smaller in size and can be placed next to your bed. If your master bedroom is large enough, a crib will also work! The two types of sleeping boil down to personal choice. It can be said that crib sleeping (with your baby in a separate room or nursery) can help foster independence and help them grow accustomed to sleeping on their own earlier. On the other hand, since babies love waking up in the middle of the night, it may be more inconvenient to care for your child at night and be harder to keep an eye on them. You may choose a 'best of both worlds' approach, where you choose co-sleeping for the first few weeks or months with your baby in a bassinet, and then move him or her to their own room and crib in the following months. What are the Different Features of a Baby Crib vs a Bassinet? One difference in a baby crib vs a bassinet is that you will typically have to purchase a mattress along with a fitted sheet for your crib. A bassinet usually comes with a mattress or a pad, without requiring any additional purchases. Bassinets can also come with a canopy or hood to shield your baby from harsh sunlight. Since the crib has a larger surface area, it may seem a bit bare at first compared to a cozier bassinet. A benefit for cribs are that they may be convertible into a bed later on. Bassinets won't have that feature, but are instead portable if you prefer to move your baby into different rooms throughout the day, e.g. in front of the TV, folding laundry in a different room, etc. 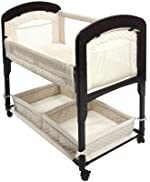 Are There Any Safety Guidelines to Follow for a Baby Crib vs a Bassinet? Yes! 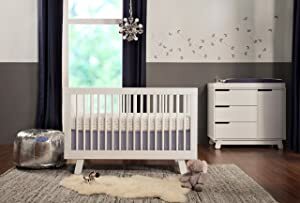 For both baby cribs and bassinets, make sure that the mattress and fitted pad will fit perfectly into the base, up to a two-finger allowance from the edge of the mattress to the edge of the crib or bassinet. You also want to check that the baby mattress is firm and flat. First time mothers will often make the mistake of wanting to create a soft and cozy environment, but it's much safer to create a bare and firm environment for your baby to sleep in. Avoid any bassinets or sleepers that have fluffy fabric on the sides. Avoid using any extra bedding, blankets, or pillows, which may increase the risk of SIDS (Sudden Infant Death Syndrome). Also, make sure that all screws and bolts are tightly in place! For cribs, make sure that if there are any bed slats, they are less than 2 and ⅜ inches apart to prevent a baby's head from slipping through. You also want to avoid any drop-side cribs to prevent your baby from injury. For bassinets, make sure you follow the weight limits specified and to transition your baby to a crib when they can sit up on their own or roll over to prevent injury from fallout. You also want to find a bassinet with a sturdy base, that is wide enough to withstand any sort of collision and not topple over. If there are any foldable or movable pieces (such as support for a rocking motion), make sure that there are locks in place to ensure a sturdy and non-moving position while sleeping. You want to avoid leaving your baby in a rocking position while they are sleeping to prevent any suffocation or injury. You may also want to look for products with a JPMA seal (Juvenile Products Manufacturers Association) which will certify and test baby products for federal and state safety requirements. Do You Have Any Buying Recommendations? Investigating price trends for products containing the keywords 'baby cribs' and 'bassinets' around Black Friday. In our investigation of 2017 Black Friday price trends (which you can read about in detail here), we found that a massive 80% of products with the keyword 'bassinet' in the product name exhibited price drops during the Black Friday sales holiday. Amazing! This signals that products with the keyword 'bassinet' are more likely to have price slashes than other product categories, where an average of only 34% had price drops. For products with the keyword 'crib', a healthy 45% of those products had price drops. Also, 27% of these products barely changed in price landing them in "The Sitter" category. One surprise was that about 15% of the products were in the "Sneaky Snake" category! These are products where prices were raised significantly prior to Black Friday, then dropped on Black Friday to a price that was still higher than the original price. This tells us that products with the keyword 'crib' are prone to more price sensitivity and changes. You may want to be more vigilant about price changes for cribs and start a price watch for products with the keyword 'crib' if price is an important factor for you. You can set up a price alert for any product on ReviewFinch by clicking on the yellow bell icon on the bottom right of any product page! Sturdy steel frame with locking wheels to roll the bassinet around. Ensure you keep the bassinet locked when your baby is in it! 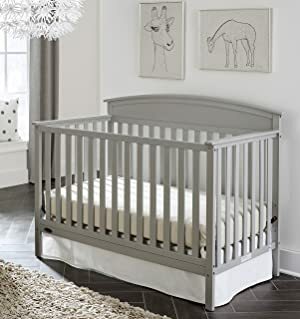 That was our comprehensive guide to the benefits and disadvantages to cribs vs bassinets and we hope that this helps in choosing a side for your newborn, or perhaps choosing to use both options. Here's a quick summary on everything we talked about!